My mom's birthday is tomorrow. We celebrated yesterday during the Thanksgiving celebration along with my children's birthday. 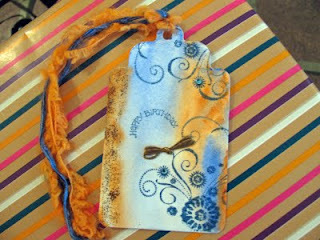 I made this tag out of water color paper. I did a wash, then when almost dry stamped it using one of Tim Holtz's blue distress inks, glittered it and added the dragonfly and gems. It turned out very nice. Mom was pleased. We are off on more traveling and more family. Happy day! 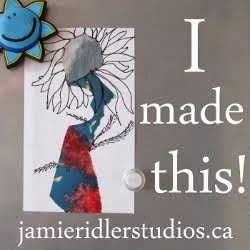 Even your gift tags are art! You amaze me... and thank you so much for your powerful, sensitive quote on my blog about yesterday. It means a lot to me. THANK YOU, and safe travels! Really pretty, I love the colors and the movement. I've been seeing lots of dragonflies today! Must be synchronicity. What a lovely gift tag. Gosh I'm going to miss what I learn from everyone with this AEDM. Thanks for your concern about my kitty. Lily is def back to herself. Hope you had a lovely day. what a gorgeous gift tag!! love it!